I suspect the following may well be controversial, but it got me thinking so I wanted to share it. It talks about gratitude and what we should be giving thanks for. “Your affliction falls well within the overarching decrees of God. It comes from His wise and kind hand and for that, you can give thanks. In it and for it.” — Joni Earekson Tada, from the Daily Devotional Email 19/11/12 Here’s the link to the original post. Does God ‘give’ disability, or just ‘allow’ it? So, does God give us our afflictions, in my case physical disability, and chronic illness, amoungst other things.Joni’s reasons for reaching her conclusion is that the daily grind with her quadraplegia brings her to God minute by minute, Another reason she gives is that God’s Word asks us to give thanks for everything so for her the ‘everything’ includes being thankful for her disability. The sovereignty of God means her suffering through her disability is not somehow separate either, as God is also Lord of her disability. Also, instead of having her quiet time and then getting on with her life, it forces her to live out her faith wheeling close to her Saviour, as i read the other morning in “More Precious than Silver Daily Devotional e-book. I do absolutely recognise the logic of her argument. If God is Lord over everything, that includes my disability… but to give thanks for it, specifically?! I do thank the Lord he is using my disability to teach me how to depend on Him for everything, and how to ask others for the help I need without becoming so dependent on them, that I shut God out. I recognise it is God who has walked me through the four years since my operation which gave me a bag on my tummy, and eventually meant I needed carers, and an electric wheelchair amongst other things. Indeed, it is God who gives me my very life, my very breath, and if he chose to, he could take me home to be with Him in an instant, but did he give me my disability, something which gives me so much pain, and tiredness, and so limits my life? He is using it for his Glory, and to help me to help others, as you can read here, if you haven’t already. if He did not give me disability, then how could he include it within His plan for my life? Indeed, God knew what each day of my life would bring before I was even born. (Psalm 139) I cannot reconcile this with God giving me my disability though. I would so like to know everyone’s thoughts on this, and work through it together. In the meantime, here are the verses from God’s Word that inspired the text of which I write. As I said on Thursday, I’m inclined to write about ‘daily prompt‘ posts the day after or later, in part due to the time difference. Anyway Thursday’s daily prompt suggested writing an op-ed’ to a news story I’ve been thinking about. I think the translation of ‘op-ed’ here would be ‘editorial comment’. I meant to write this sooner, but for various reasons I haven’t… and I’m still thinking about it… so here goes! I’ve just looked up the article and realised it was published ten days ago, but for reasons that will become clear it’s still relevant. I first saw this story when @ChrisClose50 tweeted the link, with the comment. If I’ve been really clever you should see his tweet in it’s original form, below! At first, I didn’t understand the headline at all. Apart from, it meant something bad because of Chris’ tweet. where I originally saw the story. Here’s the headline: Care homes being sold off to hedge-funds? What does that even mean? Determined to find out, I started to read. I have to say, I still don’t know what a hedge-fund is, so why was I still interested in the story?! Said hedge-fund bought a care agency, before as it turns out, so this recent acciuision of a contract and land is nothing new. So, which care-agency does this hedge-fund own? Care UK, as it turns out. (the lot who get me up in the morning belong to ’em) NOW I’m interested. There’s plenty to scare about this story, including that the land the current care home is situated on has been given free minus conditions. So that’s alright then, the company can be trusted just because they’re the ones with the pennies? Apparently not… that which haunts many a big company also haunts the big providers in the sector, and Care-UK in particular — DEBT. six of the biggest care home owners have combined debts of almost £5bn, but the corporate veil makes thorough scrutiny of finances difficult. Not only are they keeping worrying levels of information to themselves, the lack of transparency is also a concern… surely this means they have something to hide? 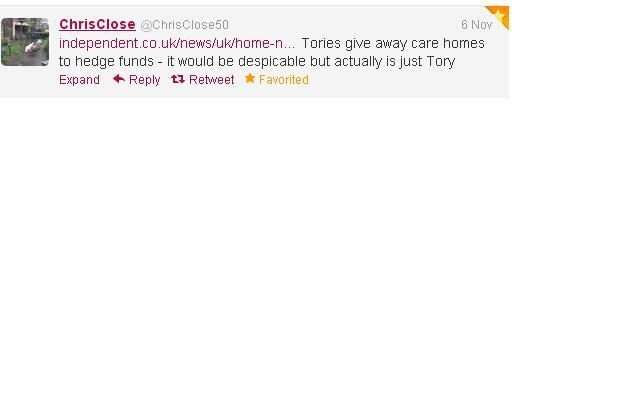 Lest we forget, Care UK took over doomed ‘Southern Cross’ care homes. However, Care UK themselves are not beyond reproach… according to the article, their debt is thought to be £480m. I find this particularly worrying given the amounts they get paid to carry out contracts of care, and how little people who work in the sector get paid. Suffolk council claims to have a ‘Plan B’ should Care UK get into financial trouble. I hope the council does get the homes they need, and I hope it all goes swimmingly. However, we may not have heard the end of this story, and am also convinced similar sell-off’s will continue in the future, unless the Government really grasps hold of situation, which at the moment, they same wholly incapable of doing. please God, can I start over? The ‘Daily’ Prompt, a Day late! Those moments where what is my head just comes out. Worse I say what is in my head without thinking. Even worse than that is I say what is in my head without even thinking in a hurtful tone of voice or in anger. Not being very physically able, the easiest way for me to hurt someone or do something wrong is by thought, speech, or both.I can think of one group of people, one carer and one PA from different times in the past few years with whom I would like to have gone back in time and ‘undone’ my actions. However, this is not possible. Thanks to the saving work of Jesus on the cross. It is possible to seek forgiveness from Our Heavenly father for my actions, and to pray that He may heal the wounds I have caused, but is impossible to go back and repair the damage I caused. That I guess, is my biggest regret when we are called to be ‘salt and ‘light’ and I am anything but. It shows me how important it is to ‘make the most of every opportunity’ to reach out to others in whatever way I can, and to remember that as tired and pained as I am this is not an excuse. Perhaps I am being hard on myself… but I do pray that those people may meet other who witness to them more faithfully that I did, and short of being able to start over, all I can do is entrust it, and them, to the care of our Heavenly Father, and be thankful, that this I can do! I didn’t have any trouble thinking of a title for today’s daily post. It is something I have often heard talked about in interviews on TV; sometimes the presenters ask the interviewees what they’re favorite songs are, or which songs have inspired them, in the case of musical artists. Today’s challenge was to think of a song and use it as the title for a post. When I started writing my blog I resolved to keep it as realistic to my life as possible, which meant the good the bad, and the stuff in between. It also means, not over-exaggerating things, and thinking before I tweet, or post! I am sure most of us are aware by now of the tendency a lot of people have to over-share, in part I think due to the false sense of intimacy that one can often have. We tend to forget about things like targeted advertising, which is when Facebook sells our info to advertisers, so that their ads get to the right people. Also because we are writing things down, perhaps it feels just like writing a letter or an email, but more people than just the friend(s) it was intended for read your updates, tweets, and posts. With all of that to think about, and perhaps a lot I’ve left out, how do we document what really goes on in life, especially with things like disability or chronic illness without being so negative you drag people down with you, or so polished that people think everything is ‘fine’ all the time? Today was one of those days where I think, “how did I ever do all ‘this’ on my own for three years?? ‘This is getting up, a shower, getting dressing changing my stoma bag breakfast, taking my medication, getting ready to go out. Sounds simple enough? Try adding in it being ‘one of them mornings’ like everyone can have sometimes, plus the idiosyncrasies of an ill/disabled body, and all the aspects of having care, and there’s one toxic mix. The morning started fairly well, as I got myself out of bed, with only a bit of crawling from bed as gingerly as possible. So far so good? Wrong! The (stoma) bag had ripped overnight, even though most of it had drained into the connecting night bag, meaning the ‘day bag was almost empty. Have explained all this to ‘specialist nurse’ who says it’s ‘just’ a manufacturing fault and I should use the other batch of bags. Sorry but I need every last one! This is also the only system I can use because it’s the only one with a night bag suitable for use with my type of stoma, when it’s likely to have to cope with undigested food and all the rest without getting blocked. So to do anything about the bag is a losing battle, unless I win the lottery… in which case I will commission the best in the country to deign me a bag for my type of stoma which is thin, durable, flexible, and kind to skin, as well as sticking to it, and has an accompanying night bag system than can come with my peculiarities. None of this being an option, we had to deal with what was in front of us, so we changed all the parts of the stoma bag before I showered. Unfortunately, the bag refused to stick, so we had to start over. This combined with other issues, meant my carer call was longer than 2 hours, just for a ‘morning call’ when I am only allocated an hour and a half! Obviously, I was utterly exhausted after all this and relieved to have a break before I went horse-riding. I started writing this, and got myself ready to go out. This means plenty of planning ahead.. a healthy lunch, that I can successful digest, plus my medication dispenser fondly known as the “UFO, my plastic beaker, and all the rest of the ‘stuff I can’t go anywhere without. Today, transport went surprisingly smoothly — result! This time I used a social enterprise company. The only firm that will drive me the two miles while I’m in my electric wheelchair. Any other refuse, or I have to use a ‘normal’ taxi with my little manual chair, which makes me completely dependent on others. Having got to the social enterprise where I learn with no incident, it was time for my ‘team’ to swing into action. The woodwork shop have made me beautiful steps, complete with handrails to help me get to the ex police horse without being lifted like before (health and safety ‘MARE as I’m sure you’ll appreciate/! Now my friend helps me climb the steps and supports my trunk enough to stop me falling, while someone else drags my leg, now rendered immobile, over the back of the saddle, while someone else keeps the horses head still… mission accomplished!! Loved it today… was almost tropical weather, beautiful views, and great company. Me and the ‘team’ got me back into my chair without incident as well, which is an absolute JOY given how painful it was before. Don’t get me wrong, it is flippin’ painful now, but at least there are less steps in the process and less risk involved — HURRAH! I ate my healthy lunch, and socialized without incident, making it home with home with help from the social enterprise again. So far so good… now to get on with this blog, writing for something else and catching up with things. I was totally wrong! I spent most of the afternoon waiting for the district nurses to arrive to help me with the bag. No one knows what to do about any of this as I am all out of options. As I sat here now, the bag the nurse(s) put on hasn’t stuck so my stomach is covered in my lunch or dinner. I am refusing to look. My skin around the stoma is already red-raw and throbbing so it’s unlikely to get better from this wither. Feels like a wasted afternoon and evening. I have between 30 mins and an hour to get more productive things done, starting now! Wish me luck… I think I might need it!